Try these easy recipes for your cookout this weekend! The weather in Boston is supposed to be gorgeous this weekend! Take advantage with these easy recipes that will have all your cookout guests talking. 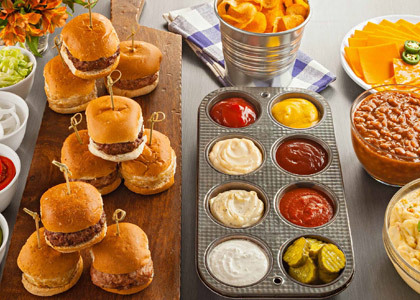 Juicy Slider Bar – Decisions, decisions! This recipe is fun for entertaining friends (or your little ones) outdoors…compete to see who creates the most unique combination and then enjoy your creations. Summer Chicken Salad – Not your average salad, this pairing of grapes and avocado is surprisingly refreshing…and you’ll feel good about it, too – it’s packed with essential vitamins! Grilled Tuna Skewers – Looking for a simple yet healthy meal? Tuna is great on the grill and this will take you less than 30 minutes. We’re in!